RÉSONAANCES: H-day -3: How to pump up the Higgs-to-gamma-gamma rate? H-day -3: How to pump up the Higgs-to-gamma-gamma rate? 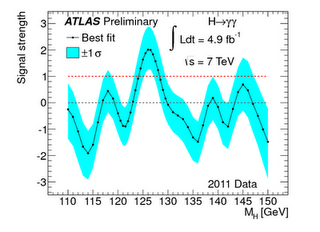 The 2011 LHC data featured a bump in the diphoton invariant mass spectrum, readily interpreted as a manifestation of the Higgs boson decaying to 2 photons. Actually, the bump was about almost 50% larger than expected assuming the Standard Model Higgs production and decay rates. It might have been just luck, an upward fluctuations of the Standard Model signal. Or it may be a sign of something interesting going on. Photons are massless, therefore, in the Standard Model, the Higgs boson does not couple directly to photons. Instead, the decay of the Higgs into 2 photons is a loop mediated process. It happens to be dominated by two contributions: one, larger, from the W boson, and the other, 5 times smaller, from the top quark. Incidentally, these two contributions enter with opposite signs (in fact it's not quite an accident but a consequence of the theorem that links these contributions to the electromagnetic beta function). The other known charged particles are expected to contribute much less because their coupling to the Higgs is much smaller. Increase the Higgs couplings to W bosons. But then one needs to explain why no excess in the WW channel has been observed. Decrease the Higgs coupling to the top quark. But then the Higgs production rate would be decreased as well, and one needs to cook up new production channels. Introduce one (or more) new charged particle that contributes as much as the top quark, but with the opposite sign. The last possibility is very attractive. It implies new physics the weak scale that could soon be discovered (the new particle couples to photons, thus it has a non-zero production rate at the LHC). Anything that has a charge and a large enough coupling to the Higgs could do the work: the new particle could be a scalar, a fermion, or a vector boson. Does the Higgs diphoton rate continues to be enhanced above the SM prediction also in the 2012 data? This is probably the most interesting question that we'll obtain an answer to on the 4th of July. If yes, it means that, maybe, maybe, new physics is really just behind the corner. can you give a reference or more information about the theorem that links the sign of the coupling of the SM Higgs boson to W bosons and to top quarks (or other fermions)? 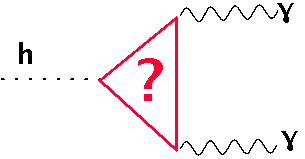 I have seen more than one theorist entertain a sign flip, leading to constructive rather than destructive interference between the W and the top loop. It would be nice to understand under what conditions such a sign flip would be allowed. "The other known particles are expected to contribute much less because their coupling to the Higgs is much smaller." - Except in the case of the Z for which it is because it is not charged so not coupled to the photon. Also there is another way the diphoton channel can be enhanced, namely if the bb channel is supressed then more Higgs will decay via the diphoton channel. Question: Can a fermion increase the diphoton rate? I thought a fermion would always contribute a negative amount and reduce the rate. I think Philipp is right. The extra charged particles needs to be a boson, for example, a stau (tau slepton) or maybe a W'. Philip: I was pedantic enough to say "to pump up the Higgs decay width" not "branching fraction"... but you're right that by suppressing the h-bb coupling you can increase the gamma-gamma rate at the LHC. But then you cannot explain the Tevatron Higgs excess in the bb channel. Philip, Michael: yes, a fermion can increase the diphoton width if the sign of its coupling to the Higgs is negative (more precisely, opposite to that of the top quark). This is possible if the fermion mass does not come from electroweak symmetry breaking, that is for vector-like fermions. If, on the other hand, the mass comes from electroweak breaking (which fixes the sign), then the theorem I mentioned relating the contribution to the beta function holds. In that case both a scalar and a fermion interfere destructively with the dominant W contribution, thus decreasing the gamma-gamma width. The theorem was first (I think) phrased by Ellis, Gaillard and 10^-9poulos in Nucl. Phys. B 106, 292 (1976). It is hard to see any charged particle able to make a meaningful contribution to the Higgs diphoton having escaped previous direct detection at LHC. Charged particles are much harder to miss than neutral ones and the precision electroweak data puts some serious bounds on candidates for this kind of particle. A selection bias that says that an initial detection is, in general, more likely to happen during a run which is statistically above average in diphoton production (since the diphoton channel is the primary diagnostic channel) than in one that is statisticallly below average in diphoton production seems more plausible. 300 MeV stau (tau slepton) would be non- observable in LHC. The "Standard Model" of particle physics originally predicted that particles have zero mass, which is clearly falsified by observation. So theoretical particle physicists tacked on the ad hoc "Higgs Mechanism" that involves a somewhat bizarre spontaneous symmetry-breaking that makes the particles have mass. It involves introducing a new field and particle(s). The putative Higgs is supposed to be a spin=0 scalar particle. All of this is a bit weird and forced in my opinion. So the question is: Do we have a Ptolemaic situation where the "mechanism" can roughly reproduce the observed phenomena, but has nothing to do with how nature actually works? Particle masses were a part of the Standard Model from the moment it was born. Besides, the model make millions of specific predictions which have been tested. It also makes concrete predictions concerning the Higgs coupling to matter which are being tested as we speak. But...who cares...you won't listen anyway. Anon, MeV -> GeV, otherwise that's right. In fact, the strongest limits on charged uncolored particles typically come from LEP. For this reason, new charged particles heavier than 100 GeV are perfectly allowed in most cases. Of course - 300 GeV. My mistake. I've read that when running at full parameters the LHC will be able to observe particles like stau up to 200-300 GeV.